WHY DO YOU NEED A SMALL BUSINESS CREDIT CARD? 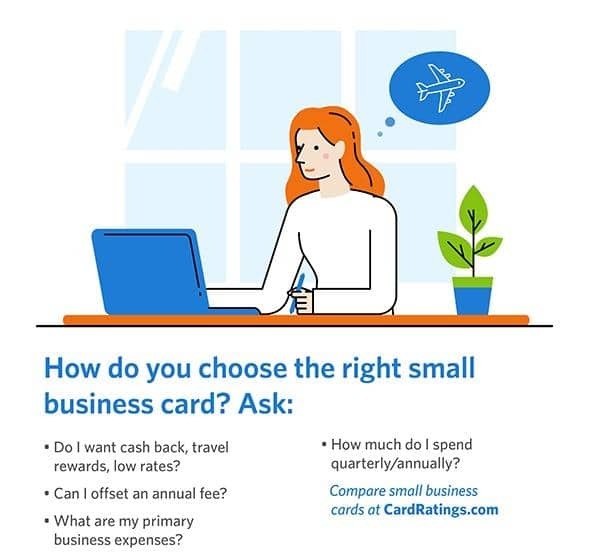 HOW DO YOU CHOOSE THE RIGHT SMALL BUSINESS CREDIT CARD? This guide provides a primer on small business credit cards. However, if you're ready to dive in, use our simple and informative table to compare the best small business credit cards currently available on the market. Small business credit cards offer plenty in the way of benefits, perks and options whether you're a business owner / officer of a company with a couple hundred employees or a sole practitioner, freelancer or contractor - or anything in between. Whether you're looking for reward points to convert to free air travel or healthy cash-back bonuses that go back to your bottom line, the right business credit card for your situation could quickly become an asset your business simply wouldn't be without. But finding that "right small business credit card" requires knowledge of the application process as well asking the right questions as you conduct your research. That's where our Small Business Credit Card 101 resource comes in. Let's acknowledge one thing right off the bat: Today's labor market is not your grandfather's labor market (or maybe even your father's). Being "in business" now means something completely different than it did even 10 years ago. For instance, according to the U.S. Bureau of Labor Statistics, in 2005 alternative workers – people "employed as independent contractors, on-call workers, temporary help agency workers, and workers provided by contract firms" – made up just 11 percent of the total U.S. workforce. Given the explosion of the gig economy in the past 10-plus years, it seems likely that percentage will have increased, possibly dramatically, when the BLS next collects these data (expected to happen around May 2017). How do these data relate to small business credit cards? Well, for starters, many of those "alternative workers" are probably eligible for a small business credit card. That means freelancers, self-employed individuals, small business owners (or authorized officers of small businesses), entrepreneurs and more could all qualify. Most credit card companies define "business" quite broadly when it comes to considering applicants for small business credit cards. In many cases, you can provide a social security number instead of a federal tax ID (EIN) on your small business credit card application. And while many applications will ask for information about your business' revenue, credit card companies are also aware that small business owners or entrepreneurs launching businesses do not yet have revenue streams. Those issuers want to get in on the ground floor of your startup business so, assuming your personal credit history is in good shape, that could go a long way in helping you get approved for your first small business card. To qualify for a business credit card, you must be an "authorized officer" of a company. Basically, this means that you must have the legal right to enter into borrowing arrangements with financial institutions on behalf of a business. If you are the owner of a sole proprietorship business or the sole owner of a small business, you are already an "authorized officer." You are, after all, the only owner of the company. It can be more complicated determining who ranks for businesses that have multiple owners. In general, though, most owners are also "authorized officers." So what do banks actually consider when deciding who qualifies for a business credit card? Jim Salmon, vice president of business services with Navy Federal Credit Union in Vienna, Va., said that his financial institution considers the personal financial history of the individuals applying for the card. This means that entrepreneurs with a history of missing their personal credit-card payments or making late payments to their mortgage lenders could struggle to qualify for a business credit card. Salmon said that his credit union also considers the type of business that applicants are either starting or running. If an applicant has an established business, Navy Federal Credit Union officials will study the balance sheet of these companies. "We look at a wide range of factors," Salmon said. "When dealing with startups, though, we'll take a long look at their personal credit and how they've handled their finances in the past." It's worth noting that obtaining a business credit card will likely require a personal guarantee, which means you, as an owner or primary shareholder, are typically personally liable for the debt. Likewise, card activity might be reported on your personal credit history and will definitely be reported if you default. The most relevant answer to this question will vary based on your situation. Maybe your primary need is to build a business credit history so you can qualify for a traditional small business loan in the future. Perhaps you're looking for a way to give employees spending power without handing over your personal credit card or going through a reimbursement process when they use their own personal cards. Maybe you just need a better way to monitor your business expenses. Only you can judge what is most important to you about having a small business credit card. Consider this: If you use your card for your expenses throughout the month then pay off the balance IN FULL before the due date, you've basically borrowed money for your expenses throughout the month. This comes in particularly handy if the bulk of your business' revenue tends to come in once or twice a month rather than spread out evenly throughout the month. Freelancers or contract workers who are paid irregularly certainly understand this situation. Furthermore, a number of small business cards out there offer introductory zero interest periods on purchases and balance transfers. That means that business owners who have some big expenses on the horizon, whether startup costs or some kind of significant capital expense, could snag themselves months of interest-free time to pay off those purchases. You can learn more about balance transfers with our Balance Transfer 101 page. Please note that this interest-free cash flow situation only works if you pay off your balance COMPLETELY every billing cycle (or by the end of the introductory period). If you don't, the interest you pay will cut into your business' bottom line. You have enough details to keep up with if you're running a small business. Trying to separate your business and personal expenses on a single credit card statement doesn't have to be one of them. A small business credit card allows you to easily segregate your business expenses from your personal expenses. Now, this may not seem like a big deal when you think about, say, separating your grocery bill from your office heating bill. But what about buying your kids' school supplies at an office supply store and buying your business' office supplies at an office supply store? Suddenly, those charges get a bit more difficult to tell apart on a credit card statement. "We think it is important to keep these two types of finances separate," said Brent Reinhard, chief marketing officer for business banking at Chase. "When we talk to small-business owners we hear that they spend a lot of time managing their business' finances. Why would you make that job more difficult by co-mingling your business and personal finances? If you really want to spend time analyzing your business' finances, it's much easier if they are confined to one place." Besides making your life easier throughout the year, you'll especially appreciate having all your business expenses separate from your personal expenses come tax time (and your accountant will appreciate it, too). Think of it this way, every time you swipe your business credit card, you're potentially looking at a tax deduction; a business-expenses-only credit card statement will help you organize and maximize those deductions when the tax man comes calling each year. Some small business cards even offer special tools to further help you stay organized such as integration with QuickBooks or other accounting software. Take a look at our picks for Best Small Business Credit cards. You know the saying, "You have to spend money to make money"? Well, it's true. Every business has expenses. A small business credit card, however, can soften the blow of those expenses with rewards or cash back based on what you spend. Business credit cards can allow the owners of businesses both large and small to quickly generate rewards points, which they can turn into free airline miles or healthy cash-back bonuses. Even freelancers and work-from-home-contractors have expenses, so you might as well rake in rewards for what you have to spend anyway. Small business credit card rewards come in a number of forms including a flat rate for all your purchases or tiered rewards in certain categories, many of which are designed specifically with common business expenses in mind – think travel, shipping, office supplies, advertising, etc. As an added, well, bonus, many small business credit cards offer healthy signup bonuses for new cardholders. Many of these bonuses equal a few hundred dollars in cash back or enough miles or points for a round-trip flight or two. As we mentioned earlier, small business credit cards are specifically structured to meet the needs of small business owners/officers. That means the reward tiers tend to focus on common business expenses and features like free additional cards for your employees are pretty standard. 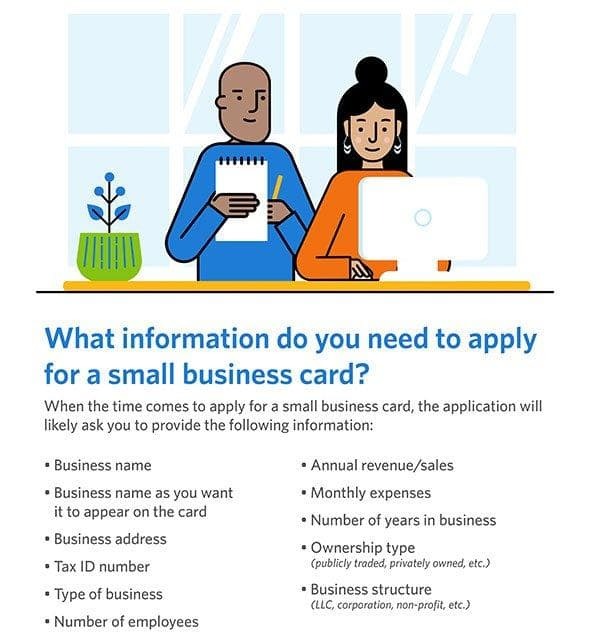 In addition, however, small business cards also tend to come with higher credit limits than personal credit cards do, a tool that cash-strapped business owners can use to purchase needed equipment and supplies to help their businesses. That said, business owners and entrepreneurs must still keep a tight rein on their spending. As mentioned above, don't make the mistake of thinking that misusing your business credit cards will have no impact on your own personal credit scores. Many financial institutions have policies stating that when cardholders pay late or miss payments on business credit cards, their financial miscues will be reported to the three national credit bureaus. This means that entrepreneurs who skip payments on business credit cards taken out in their names will see their personal three-digit credit scores fall. "It can be challenging for entrepreneurs. You are not guaranteed a paycheck every two weeks when you are running a business," Salmon said. "The cash flows in a business can be less predictable. You have to be responsible. You must know that you can pay off this debt. If not, you can get yourself in trouble. You are taking on a financial obligation when you use that card." Ultimately, your credit limit will depend on several factors. Banks will look at your personal credit report and, if you have an established business, they'll also look at the revenues of the business, how long it's been operating and how healthy it is. Additional advantages of many small business cards include access to specialized expense tracking software and, in some cases the option to spend above your credit limit penalty-free or extend your billing cycle. One thing small business credit cards DON'T come with is the same protections offered to consumers under the Credit Card ACT of 2009. A lot of the consumer-friendly aspects of the Credit CARD Act of 2009 don't apply to business lines of credit, so don't expect the same protection in terms of rate increases, which fees a card can charge, how you're billed and when you're expected to pay. This is pretty basic, but definitely something to note. If you plan on being in business for years to come, you're going to want a solid credit history for your business. Sure you can work toward that by paying your utility, rent and other bills on time, but having a small business credit card will also help you along that path. That's assuming, of course, that you use the credit card responsibly and never miss a payment. As with the search for personal credit cards, when you're researching small business credit cards there are a number of factors to consider before signing your name on the application line (or clicking "submit" online, as the case may be). Don't neglect taking the time to honestly consider the state of your business, the reasons you're considering a small business credit card and the most important features you're looking for in the card. Beyond those general considerations, you'll also want to think about where you do the bulk of your business spending; whether you are willing to pay an annual fee (in general, you should only pay an annual fee if you're earning enough rewards to offset it); and whether cash back, points or travel rewards are most appealing. Now that you know you could qualify for a small business card, you're clear on why you want one and you've done the research to narrow down the options to the one for which you want to apply, it's time to gather everything you need to submit that application. You'll need a lot of the same info you'd need to apply for a consumer card, but if you have an established business, you'll also want to have some basic info on hand about your business: Your annual revenue, how long it's existed, the business address and more. If you don't have full business info yet but still want a small business credit card, go ahead and apply. But – and this is a big but – DON'T lie! As we mentioned earlier, banks understand that startups need credit cards, so don't stretch the truth trying to create business details that don't yet exist just to qualify for the card. Don't panic over the info and try to keep in mind that not having a business history doesn't automatically disqualify you from getting a small business card. The bank will just look at your personal credit history to determine whether you are approved. (Frankly, they'll likely look at your personal history even if you do have an established business). If you have any questions or doubts about your application, call the issuer's customer service number and speak with someone directly. Used responsibly, small business credit cards can be excellent tools for business owners to have in their pockets. Ready to start doing some research? Compare top small business cards here on CardRatings.